Singer Alfred spectrum analyzer MF-5 with VR-4b video module covering 300KHz to 27.5MHz. The frequency range is considered narrow by today's standards, but these make excellent panoramic adapters for classic high-end communications receivers. A fun use is to monitor foreign shortwave signals to see if a bit of NFSK shows up hidden on the carrier..
LogiMetrics (subsidary of Slant/Fin Corp.) Signalock 925 RF signal generator. Covers 50KHz to 80MHZ with AFC frequency locking and AM/FSK modulation. Nixie tube display of frequency. For those with classic vacuum-tube type crystal-controlled tranmitters, it's +20dBm output also level makes it a useful VFO. 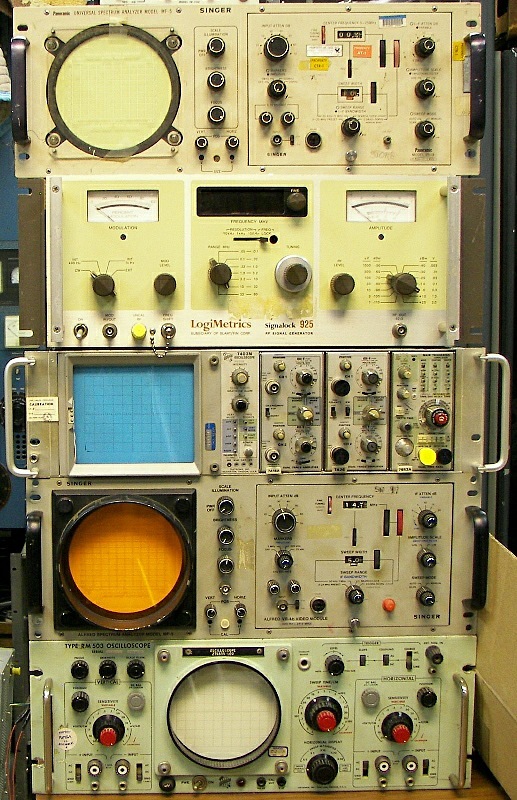 Tektronix RM 503 oscilloscope. Unit covers DC to 500KHz. Identical horizontal and vertical channels with balanced inputs make this unit excellent for X-Y displays. Mostly vacuum tube technology. The CRT is capable of great brightness. This impressive model was very popular with computer repairmen in the 1960's, and was even built into computers as a display device, such as in the early DEC pdp series. Despite its large size, it is very light in weight. They still turn up at swapmeets for $25 to $50. Singer Alfred spectrum analyzer MF-5 with VR-4 video module covering 1MHz to 27.5MHz. This one has seen better days.. This unit is the one with the blue CRT. 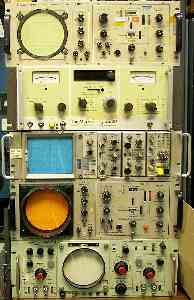 Tektronix R7403N 60MHz mainframe with 7A18A 75MHz dual trace vertical amplifier, 7A26 200MHz dual trace vertical amplifier, and 7B53A Mixed Sweep Dual Time Base 100MHz/5ns/div.